If you’re the kind of music buff who isn’t content to have your killer sound system devoted to just one room, Sonos’s award-winning Multi-Room Music System ( ) could be what you need. 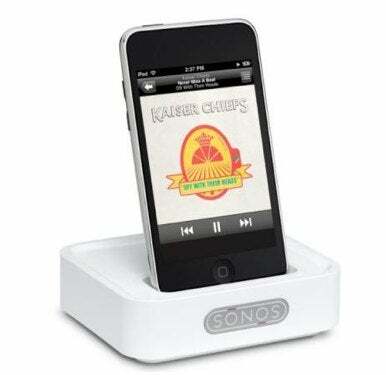 The company, known for melding high quality sound with high-tech innovation, has added a new, iPhone-friendly tool to its aural arsenal: the Sonos Wireless Dock. The Sonos Multi-Room Music System creates a mesh wireless network with access points—called Zone Players—in as many rooms as you want. Each Zone Player contains or connects to speakers, and the resulting network lets you listen to whatever music you’d like in whatever room you’d like via your wireless network. Made to complement this system, the Sonos Wireless Dock accesses the music stored on your iPhone or iPod and sends it wirelessly to Sonos ZonePlayers throughout your home, letting you enjoy your device’s music from any ZonePlayer-equipped room in the house. Set for an early October release, the Sonos Wireless Dock is priced at $119 and will work with the iPod classic; third-, fourth-, and fifth-generation iPod nano; and all iPhone and iPod touch models.